Home > News > Merry Christmas and lots of hugs! Merry Christmas and lots of hugs! 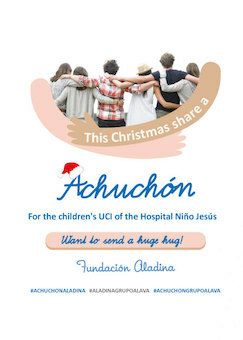 This Christmas, Grupo Álava collaborates with the campaign of the Foundation Aladina "A huge hug - Achuchón - for the infantile UCI of the Hospital Niño Jesús". A social action where each hug cares, as this collaboration has achieved multiple improvements for this necessary children's area and to illuminate the faces of the little ones. This act so easy to facilitate the new UCI Aladina of better technology and amenities to cater for more than 800 seriously ill children every year. We want the little wrestlers not to lose their smile, sending them this squeeze full of positive energy. We need a lot of hugs to get a smile on the Hospital Niño Jesús in Madrid. Would you like to send them a huge hug? The cookies used on our website are first-party and third-party. They allow us to store and access information related to the language, the browser used and other general features defined by the user and to track and analyse their activity in order to improve our services in a more efficient and personalised way. However, you can configure your browser, allow or block cookies, or select those that can be installed and those that cannot by following the procedure for the browser used. If the user decides to block the cookies, Alava Ingenieros cannot guarantee that the services provided by this Website will function correctly. A cookie is a file that is downloaded to the computer, tablet, smartphone or any other device on accessing certain websites. Cookies allow a website to store and retrieve information about a user or device's browsing habits and depending on the information it contains and how the device is used, they can be used to recognise a user. Under no circumstance can cookies damage your device. In fact, enabling cookies helps us to identify and resolve possible errors. Name: PHPSESSID. Suplier: alava-ing.es. Purpose: This cookie is used to find out whether a session is established for the user. Name: cookie-compliance. Suplier: alava-ing.es. Purpose: This cookie is used to hide message about cookies policy. You can configure your browser, allow or block cookies, or select those that can be installed and those that cannot by following the procedure for the browser used.